Over the years since Producer David Briggs passed away, there has been much discussion of Neil Young's subsequent albums which have been "Briggs-less". Much of this discussion is on the theme of "If David Briggs had produced the album [insert title, say "Peace Trail"], then it would have turned out more like [insert title of Briggs produced album]." As folks have observed here on Thrasher's Wheat before, even the strongest sword blade needs sharpening at times. Neil Young's erstwhile Producer David Briggs -- who passed away in 1995 -- was integral to the recording of most of Young's most acclaimed albums beginning with "Everybody Knows This Is Nowhere," in 1970. David Briggs also worked on albums with: Spirit, Tom Rush, Nils Lofgren, Steve Young, Nick Cave and the Bad Seeds, and Royal Trux. Neil: "He told me what was wrong with my performance at Bob-Aid (1992 Tribute Concert to Bob Dylan). Everyone else was telling me how great it was. He didn't belabour the fact that it was great. His opinion was: 'Yeah, it was great, OK. It was great BUT forget about that because what was wrong was... this, this and this. You sang it in the wrong key, your voice was too low, the drums weren't tight enough 'til half-way through... No-one'll probably notice but... It's not usable.' (Laughs) And I always listen to what he has to say and take note of it. " "There certainly weren't any recordings of Neil Young and Crazy Horse that David Briggs wasn't involved in," Joel Bernstein recalled. David Briggs had the capacity to make you feel like an integral part of the whole picture no more or no less than any other part of that picture (or song or Album) than even Neil himself.....Neil (and myself) respected David on the highest of levels when we all were working alongside his illuminations.....David was a brilliant light for all of us to work in.....he could take from us our self doubts and shadows and devour them gone....he was like a black light and the best of us came forth and glowed in his presence ....i miss David and i send 'Thank you's' to his spirit with every new piece i create. David Briggs considered every other project he didn't produce to be inferior. Briggs was known for being quite a gentle and caring man (as well as passionate and opinionated), but alcohol and drugs could (and did) interfere with that from time to time. The thing is not to agree with all his out-spoken opinions, but to recognise the huge influence he had over Neil's work. In Briggs' words: "If I'm in control, I motivate Neil like nobody else in the world". Some fans are uncomfortable with Briggs, because they can't relate at all to someone who could be so direct and critical to their hero. They forget that Neil LiKES people like that. People in postitions of power are used to their circle sucking up to them. So when the opposite happens, it's a breath of fresh air. His real talent was knowing how to produce Neil in away that pushed him into recordng his best music. Briggs didn't produce all of Neil's best records; but he did produce most of them, and his influence is there on all the best ones (even those made since his death). Even Ordinary People is very Briggs-esque in the intense and hard-hitting way it is performed. And the drop off in quality control between Briggs' last Crazy Horse record and the first one without him is notable. That sense of quality control is something that has been lacking sometimes in recent years. I think it was Jimmy McDononugh who put it memorably as "like cheap chinese parts on a Lionel train". I think in some ways that Neil has become so obsessed with the red herring of audio resolution that he has forgotten there are other types of "Quality" that deserve greater attention. The Monsanto Years doesn't suffer at all from audio resolution; it suffers from (occasionally) half-baked songwriting and band arrangements that are the audio equivalent of wet cardboard. Easy problems to fix; but only if the desire is there to do so. David Briggs would have fixed these issues. That was his ability, to cut through the nonsense and focus on what mattered. Unfortunately no one else has come along who can take his place. Although Poncho Sampedro seems to inspire Neil in much the same way, as a band member rather than a producer. Re: Ordinary People. To my ears, Studio version and Jones Beach > Bluenote Cafe. The guitar playing is more exciting on the studio version and Jones Beach versions; there's more a sense of a build up in intensity. But I love Bluenote Cafe in general, and am very glad it eventually got released. I think the bottom line is that Briggs was a strong personality, and he had the rock 'n' roll attitude. When you are making rock n roll records, those attributes tend to provoke exactly the sort of chemical reaction required to create magic. And of course, Briggs's greatest fan is Neil himself, who dedicates much of Waging Heavy Peace to him in the most reverential of ways. As Neil notes in the book, although Briggs has gone, he feels it is important that his spirit lives on. He also notes that he hasn't always lived up the Brigg's standards since ("I have failed to do that in some instances"). "Briggs and I made my best records - the transcendent ones....we somehow knew the way". Reading that, there should be no doubt that the "missing friend who's counsel I can never replace" in No Hidden Path refers to David Briggs. Thanks Scotsman as always for well considered comment and context. As we posted in 2016 when this interview surfaced: Originally broadcast in November of 1977 on WHFS 102.3 FM (Bethesda, MD) program "Aircheck", from the Thom Grooms show. This is an over-the-air broadcast that was recorded (static can be heard). The music from this original broadcast has been removed per the Digital Millennium Copyright Act, however, the interview in it's entirety, and the original WHFS 102.3 FM commercials remain intact. In a word, chemistry ? Chemistry indeed.... 18 brilliant releases produced with David Briggs. Speaking of chemistry, The Beatles had Sir George Martin at the helm for all but Let it Be which many see as one of their weaker efforts, and of course the White Album was also a bone of contention for Martin as he felt it was better as a single album. Sadly David Briggs and George Martin are no longer with us, and although it makes for interesting debate and insight into the importance of chemistry when creating music; I'm not sure it has any validity in context to what Neil is creating now. Artists like everyone go through changes during a lifetime and those changes are inevitably going to change the landscape profoundly. Looking backwards has never been one of Neil's strengths (i.e. Archives 2) and he always seems to be moving forward with intensity. As nice as it is to think how different his music would have been if David Briggs was still alive, I'm not sure it serves any purpose since none of us will ever know what the outcome would have been. I certainly agree that David Briggs was one of Neil's most formidable allies, and they created magic together to be sure. I just don't see the point of beating a dead horse..... It's clear that David Briggs is not coming back to life anytime soon, and thankfully Neil Young is still among us, so I respectfully submit that the past is simply gone for good and we need to move forward with Neil. The past has taught us that David Briggs was a great producer and the present shows us that Neil Young is still here creating music, and the future is..... unknown. When David Bowie passed away the world to me felt like it had lost something vital and important. For me it still feels a bit empty and lacks a sense of unpredictability that Bowie always seemed to bring with him. Sadly that is gone forever, but we are left with a legacy of music that was left behind that can enrich the world forever. Neil Young is still here and still creating his legacy and for that I am eternally grateful because there will come a time when that will no longer be the case. As long as Neil keeps creating I will continue to keep listening, and hopefully he will continue to challenge us and confound us, just as he has always done. I don't know if "Ed Tyre" reads this blog, but I'd like to offer a word of thanks for his excellent field recordings from the 2012 tour with Crazy Horse. I'm just listening to the Philadelphia tape. With a couple of microphones, Ed has captured a more realistic and more exciting sound than you will hear on many of Neil's recent official releases. Which is astonishing, really, considering the challenges and limitations offered to a stealth taper. And of course, the performance is a little rough around the edges; peaks and troughs. And it starts very shakily with a version of Love And Only Love that takes an age to drag itself out of first gear. But it also showcases the most exciting, most intense, most thrillingly-alive music Neil Young has made in the last decade or more. Easily. I'm talking about the then "new" songs. Walk Like A Giant. Ramada Inn. A breath of fresh air. And what is most scary of all is just how youthful they sound, just how much burning energy there is. Considering that the average age of the backing band has dropped by about eighty years between 2012 and 2015. THIS is what Rock 'n' Roll is supposed to sound like. Ralph Molina recently commented that when Neil plays with Crazy Horse again it "will be more intense", and judging by this recording, you can't doubt that. Age apparently means nothing; until it kills you. I don't know what David Briggs would think of most of Neil's music in the last 15 years. And I don't know if it has any relevance. I agree with Dan's nice comment above. But I'll tell you this for certain: David Briggs would have appreciated these 2012 versions of Ramada Inn and Walk Like A Giant. Have no doubt about that. And he'd also have appreciated Ed Tyre's beautiful recording. FlyingScotzman: my wife and I were fortunate enough to be at Red Rocks on August 5th 2012 and Neil was really joyful that night and he and the Horse were on fire. It was only the second night of the tour but they sounded as if they had never stopped working together at all. It was my wife's first time at a Crazy Horse concert and she was just blown away by the energy. Not only were they having fun but they were moving the air molecules with intensity and skill. I don't know who actually recorded the concert that I was able to obtain from that night, but it sounds great for a audience recording. I would love to find a way to hear the recording you mention in your post, if there is a way to get it I would love to know how. @Dan Swan, I completely agree re: Beating a dead horse. When someone dies or passes on, that's not something any of us can change and it isn't reversible. Living in the moment is the best way to improve the future. And the current moment, as regards Neil, is that he continues to produce new stuff at a prodigious rate, despite the losses of Briggs and some other great collaborators of years past. We can debate the quality of new works all we want, but I maintain that it's much better--and certainly much healthier for the artist--to keep on producing, to continue tackling new creative frontiers. For most artists of any kind, it seems to be almost reflexive and certainly vital to the quality of life, that the endeavor of creative expression remains intact and that, through their work, artists remain vital and in touch, both with the world and with their own sensory experiences. So, it may be that what Neil produces today is not perfect. But my hunch is that it's still important to for him to get it out there and to feel the vital energy that comes from trying new things and continuing to adventure. And really, can anyone name an absolutely perfect Neil Young album? Or a perfect album by anyone? My experience is that, no matter what, there will be strengths and weaknesses. And if you can appreciate the strengths, it will give you a better foundation, either as an author or as an audience member, to work through the weaknesses. To my ears, the best shows on the Alchemy tour were the relatively early ones. By the time the tour reached Europe in 2013, it strikes me that the fire had already started to burn out. Re: Briggs dying. The thing is that even now Neil still values his advice and tries to live up to it. He writes in Special Deluxe how a lot of conversation at the Psychedelic Pill sessions revolved around Briggs, and how they were trying to reach his standards. So yes, David is dead, but this hasn't completely removed his influence over Neil's records. The somewhat Briggs-esque sound on Peace Trail (reminiscent of the late-seventies acoustic records) is clearly better sounding than the muddy, distant-sounding mess of much of The Monsanto Years. Yes, Briggs loved the "live" sound, but he also liked it to sound good. A subtle difference. And to this day, the best Neil Young records and tours are generally the ones with the strongest Briggs influence. I have the whole Alchemy Tour on cd.ive heard every show.I attended the Cleveland & Kitchener shows.What made these shows special was the new songs.WLAG,P.Pill,Ramada Inn,Twisted Road,give a listen to For The Love Of Man from red rocks,so superior than the studio.Yes,Ed Gendelmen recordings are excellent,The Philly show is great.Check out the Sandy Hurricane benefit from Atlantic City,another Ed recording.The Fairfax show not sure if a Ed recording but it's a good one,has a great version of Poncho & Neil playing cat & mouse with their language.Its really funny,Poncho says something like you guys paid money to come see this guy etc.The Toronto show is a very good recording with Helpless played electric.The Kitchener show Farmer John was played with Los Lobos.Not many times theirs been special guests playing with the Horse.Pearl Jam in '95 at the hall of fame awards,bridge school shows,any others? The '13 Australia shows with the horse were excellent check out the 3/13/13 Plenary Melbourne show.The Europe summer tour had some good shows.Surfer Joe & Moe The Sleaze saw the light of day.i listen to the last show in Oslo,Norway all the time the day before Poncho broke his hand and the tour was cancelled.That show is great give it a spin.The last show with Ralph,billy,poncho,neil.Their was shows remaining in Europe.Then a festival in sept in Ontario,Canada, the Capital Theatre show in New York.And the 9/21/13 Saratoga springs,ny farm aid show was with Crazy Horse,neil played solo i was their.Those shows were all cancelled because of Poncho hand.Those shows would of been great.One could imagine the capital theatre setlist,kinda similar to the 3/13/13 Plenary,melbourne,australia show.Out of the 10-12 crazy horse tours since '70 my favorites are the '03-'04 greendale tour and the '12-'13 Alchemy Tour.The '76 tour has some great shows,and the '78 RNS tour is what got me a huge Neil fan.Whats everyone else's favorite tours. I saw the '86 Rochester,NY show. The '96 shows Canadaigua,Barrie,Hamilton Halloween show,Buffalo. The '97 Vernon Downs,Saratoga Springs shows. The '03 Burgettstown,Saratoga Springs 4th of July shows. I've been listening to alot of those shows I've attended and the Horse is where's it's all at. Another Ed recordings I heard last week was the 10/8-9/14 Philadelphia solo acoustic shows,great audience recording with a setlist to die for,storytone solo songs,pocahontas,southern man,thrasher,harvest,etc.Worth checking out. @ Lloyd - Just one word "chemistry" so nails it. And look how many words it generated subsequently!? Thanks so much for starting the fire. @ Dan Swan - yes, while this might not have much validity to what Neil is creating now, as you say, it does provoke a deeper introspection of where Neil has been and where he might go. We agree also about beating a dead horse... but it seems that some long time fans are having trouble moving on from the days ragged glories to the present REALity and its Promise. And we hear you on David Bowie loss. Speaking of, ever catch this? David Bowie [1947 - 2016] Covers Neil Young's "I've Been Waiting For You", Berlin, 2002 . @Scotsman - oh yeah, we know Mr Ed T quite well and have a few of his masters. You can probably hear on a few as we've sat next to him for some of the Philly shows over the years. 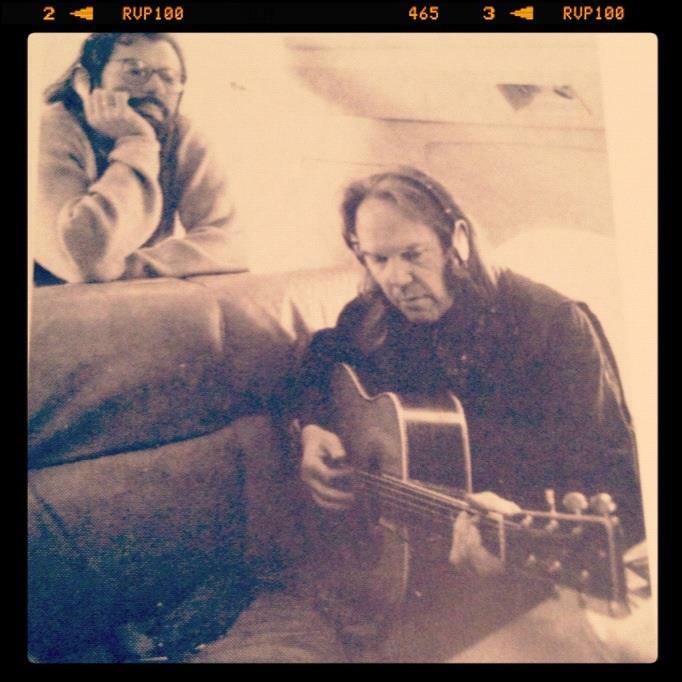 @ Ian - Good questions: can anyone name an absolutely perfect Neil Young album? Or a perfect album by anyone? @Soldier Steve - great rundown! Thanks for sharing your favorites. We're all on that journey through the past as the days fly past and we lose our grasp. "He was my best friend. No one can take that away from me". About Psychedelic Pill: "And we have John Hanlon, taught by Briggs, to engineer this sucker". Mixing Psychedelic Pill: "Birggs was there with us in spirit". "We were all happy that we (mixed Psychedelic Pill) together, but Hanlon and I still missed Briggs. A day never went by when we would not think of or mention Briggs, and we talked about him all the time during those sessions (in 2012)". About Toast: "I missed Briggs, I knew that much. But we had Hanlon, and he was getting a great sound". And many more. In fact, no one gets more of Neil's attention in Waging Heavy Peace and Special Deluxe than Briggs. Nobody. So I realise that these comments are inconvenient for anyone who arguing Briggs is someone who should be firmly left in the past. Clearly Neil disagrees with you. Note that he's not saying that he can't make good records without Briggs. Of course he's not. He IS saying that he considers Briggs influence to be an important part of making a great record in the present day, even though Brigg's isn't alive any more. In other words, anyone who undervalues the Briggs' ongoing influence (in the present) has not paid attention to Neil's own view on the subject. @Scotsman - appreciated & understood. Thanks for clarification here on the debate. Clearly the Ghost of Briggs looms large still in Neil World. Our point above about "living in the past" is the persistence of some who say "if Briggs had produced Peace Trail (or any post-Briggs release) then X, Y, & Z would have happened"
While true, it just seems a bit of a tired exercise. That said -- not to be too hypocritical here -- we do conduct "tired exercises" from time to time here @ TW. For example, the meaning of "Powderfinger", Were Neil & Ronnie really friends, Bob Vs Neil, etc. So we'll just say, any and all comments on Briggs are always welcome. Scotzman: Each of us hope to leave something behind when we leave this realm. One is only truly dead when their name is no longer spoken. David Briggs left behind his influence, craft, talent, gift, and friendship with Neil and everyone else who were touched by his spirit. I have lost many dear friends and family throughout my life, yet each of them lives on within me and their influence is always present. I believe that Neil still carries everything he was given from David, and continues to apply that influence in everything he creates. Think of it as a ripple effect. We are all creating this ripple effect each and every second we are here, and everyone around us is effected by it. My point is that even though David Briggs is no longer living in this realm, he is by no means gone. His ripple still reverberates. @Dan - we think everyone on this thread is in general agreement w/ you, Scots and others. @ Ian: Your point is well taken. Artists of all types are driven to move forward, to challenge their craft and discover new frontiers. Without that drive, creativity would become static and die. Neil Young is alway challenged himself and he remains one of a short list of artists in the music industry that is constantly pushing. @Thrasher: I am grateful to you for creating this space so we can all share our passion for Neil, but also on life. Spirit Road indeed. I really think that Ronnie Van Zandt respected Neil.Not sure if they actually hung out? Ronnie wore his TTN T-shirt on stage.Gary Rossington has said in interviews the whole band would listen to Neil records.Neil was going to give them Powderfinger & Sedan Delivery & Captain Kennedy to record but we all know the tragic event.Now Johnnie Van Vandt,Ronnies younger brother is a different guy.I have saw them in concert numerous times since '90 and Johnny gives Neil the finger during sweet home Alabama.I think it was those 3 songs that Neil had for skynyrd correct me if I'm wrong.On the '83 rockline radio show with Bob Coburn (RIP) Neil said he liked skynyrds music and thought they had a good beat. Coming off spending the week with Phillip Glass as one of his "young artists" it was kind of strange reading something I wrote twenty-one years ago on Rust. Sadly, what I wrote back then has come to be now to my ears anyway. Did like "Earth" a lot but the Briggs stuff is almost like it is "out of time" that exists in that music place where great artists get their ideas as Phillip Glass told me this week. Sure would be interesting to get all the Neil Young gang together (Elliot, Joel, Hanlon,the Nashville David Briggs, Demme and such) for ten days looking at the career of Neil Young the way they did with Phillip Glass this week titled "Glass At 80." It was a hell of a week! Those were some good shows indeed.cant wait till the volume 2 of the archives come out and hopefully their is some Live CH shows to enjoy.We know were getting the '76 Budokon Japan shows but I hope we get a complete RNS show with welfare Mothers,drive back,COBLGDT,Thrasher,Bright Sunny Day,Sail Away on the live cd.some of those are on the movie but not on live rust.volume 2 will be from what years? '73-'83 -?. Bright Sunny Day,Drive Back,Sail Away were played only once but it was a magical tour.I listened to the Madison,wisconsin show the other day as it randomly started playing on my pono. @Scotsman, You raise a good point. And my comments shouldn't be construed to suggest we forget about Briggs, or other older influences, altogether. I suppose the tricky thing is, you can't really separate past from present from future. It's all part of the same continuous flow of information and sensory input. I'd like to think that my term of choice, the moment (as in "living in the moment"), can circumvent this paradox to make a bit more sense of things. In other words, the moment includes everything that came before being synthesized with what we're doing and thinking "now" (any of the many, continuous flow of "nows" throughout our lives). In other words, the present is of course impact by the past. We don't completely leave behind the friends and loved ones that pass on or exit our lives for one reason or another. There are ways to apply all that previous influence and learning constructively to the present, and then there is living in the past. I'm not one to believe the magic died with Briggs, by a long shot. If it really is magic, it shouldn't die with any one person. One hopes and imagines that Neil, Hanlon, et. al., absorbed some of that mojo from Briggs and other carriers. There's lasting value only in magic that can be transmitted from one person to another. Of course it is not possible or desirable ever to consign something entirely and solely to the past. Partly because, as I said, the lines between past/present/future are blearier than we might think. I'm just not one for glorifying, or in any way harping on, previous things at the expense of the moment. Tom, My first NY show was the night of the Redskins - Dolphins super bowl in 83. Neil came through on the solo Trans tour. I'm guessing you have a few years on me as I was 12 when you saw your first. @ James - Interesting on the "Glass At 80". We can see how the legacies tie together. And it would be great to see more of these comprehensive retrospectives put together on Neil. Hey, know the feeling about going back and reading Rust post 25 years after the fact. Our 1st rust post on the song Thrasher is kind of a dreadful mess of writing. But it's kind of funny that's how it all started. Good to see you Jim. Hope all's well and hope to see you more in 2017! @ Peacelover Doc - definitely some good memories there! @ TOM - a good run there too. @ Ian - Your point about magic being transmitted is fascinating. And when you get right down to it, that magic and the sharing thereof is what it is all about. We've also heard this referred to "The Flame" and "Holding The Candle". Actually, this concept is all over the place symbolically. Well, be the rain ... and you are ... clearly.